Leopold gets the distinction of being my first review from the new neighborhood. It was a great pick for many reasons: my mother lives in the Netherlands currently (right next door to Belgium) where the cuisine gets inspiration, it's close to our new apartment, and the best reason is that Leopold is located in the old "Relax Lounge" space but still has the neon green glowing sign outside. Why that's important is that Erica and I had been the Relax when Top Chef Dale Levitski did impromptu dinners Wednesday night before he landed at Sprout. That was fun. I was impressed with the decor and setting - very clean and modern with nice wood accents throughout. The main bar from Relax did not move and takes up a large portion of the front room. However, that makes sense given how many great beers and wines they have on the list. If the alcohol list appears overwhelming, the food menu if very approachable. I appreciate that you have one page with a list of options and no pre-set courses. There are oysters, scallops, sausages, cassoulet, rabbit, cheese, and other nice options from the region. Most would call it "farmers' food" since everything but the fish is made or found on a farm with relatively simple preparation. We (Erica, and our first time with friends Brad and Kate) started with three small plates: mixed greens, pierogi and a giant pretzel. 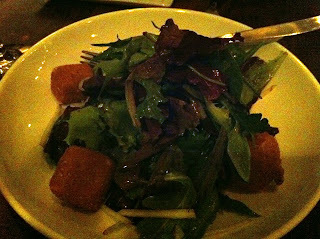 I liked the mixed greens as a fresh start to the meal, but our favorite touch was the gouda cheese croquette. 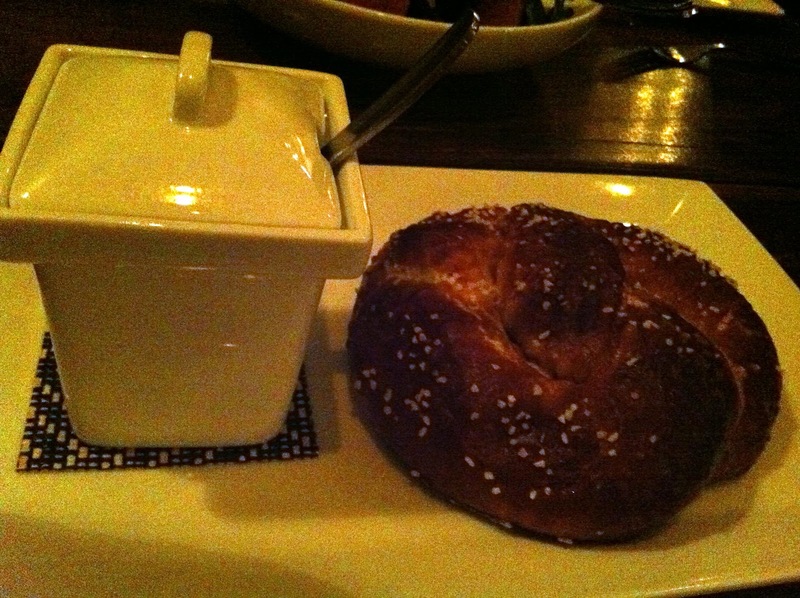 The large pretzel was very large but awesome. 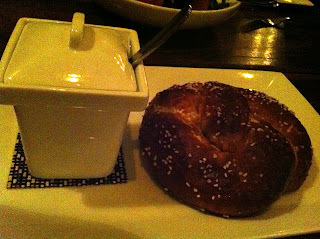 It was almost more like bread texture than soft pretzel texture and that was a good thing. The currant mustard served was delicious. Our least favorite of the three were the pierogis. It seemed like they were missing an extra boost of flavor - butter, brown sugar, sauce, just a little something extra. Like most restaurants these days Leopold suggests sharing many of the plates. We started with three small, and only went with four large plates - effectively ignoring the "sharing" concept and ordering as usual. Of course we did share with each other, but not in the intended way. I was also surprised that they suggest sharing because the presentation is beautiful and looks like for one person. Our four dishes were beef shortrib (a smallish dish), scallops (with caramelized endive, candied walnuts, bacon, port poached pear and crispy pumpernickel), the cassoulet (confit rabbit, braised pork belly, german brat, cannellini beans and breadcrumb crust) and I ordered a seafood special with arctic char and mussels. 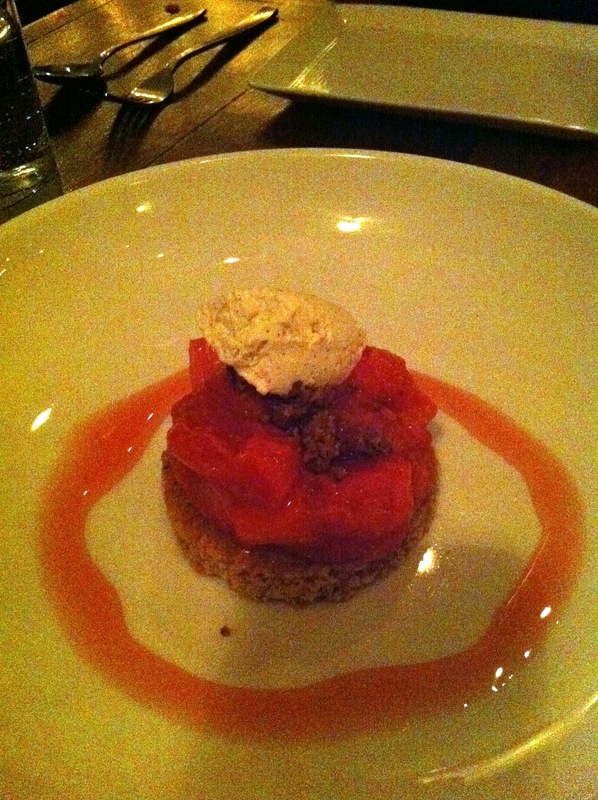 Unfortunately the main feeling of our larger dishes was underwhelmed. 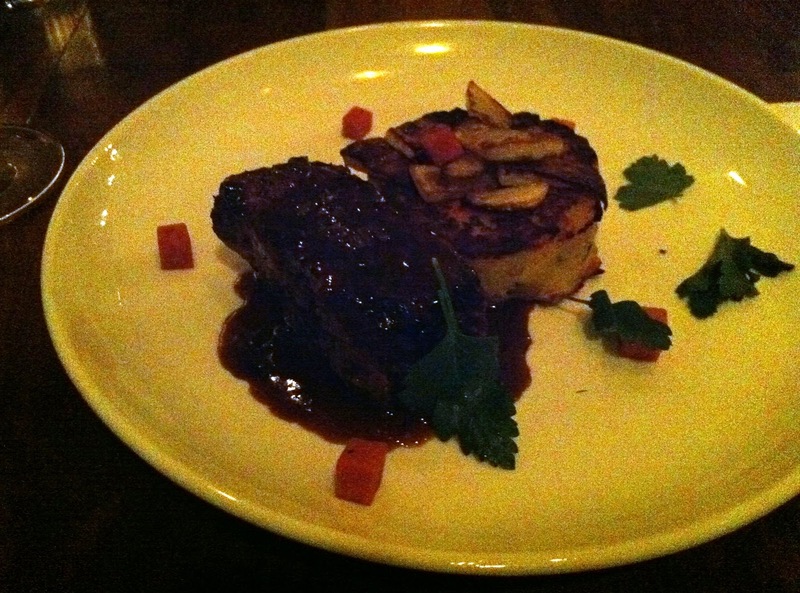 Erica's beef short rib was fantastic and was almost ordered twice. 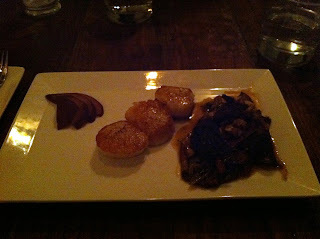 Kate had the scallops (only three) which were nice but not a very complete dish. 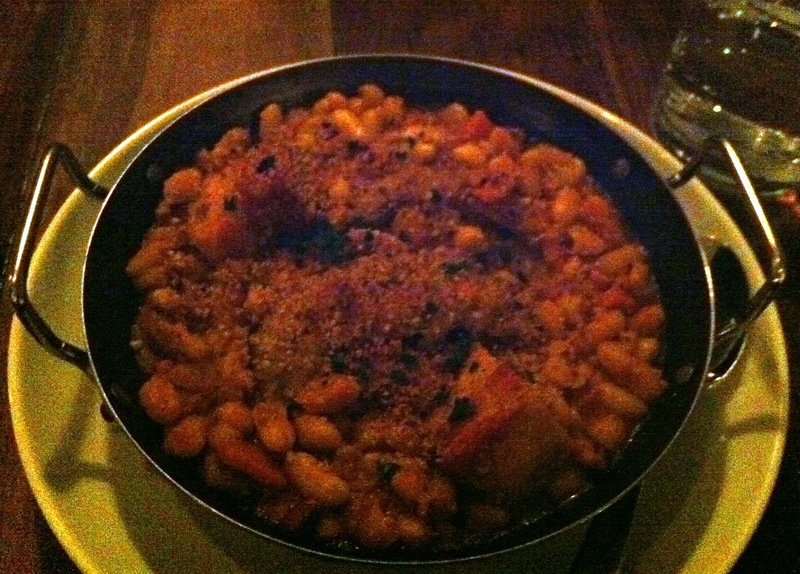 Brad's cassoulet was designed as a large dish and it certainly was not finished. We picked out all the good meat chunks, but you have to love beans to finish the entire cassoulet solo. 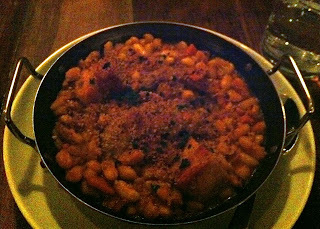 I don't love cassoulet but again, between meat bites was uninspiring. My fish dish was similar. 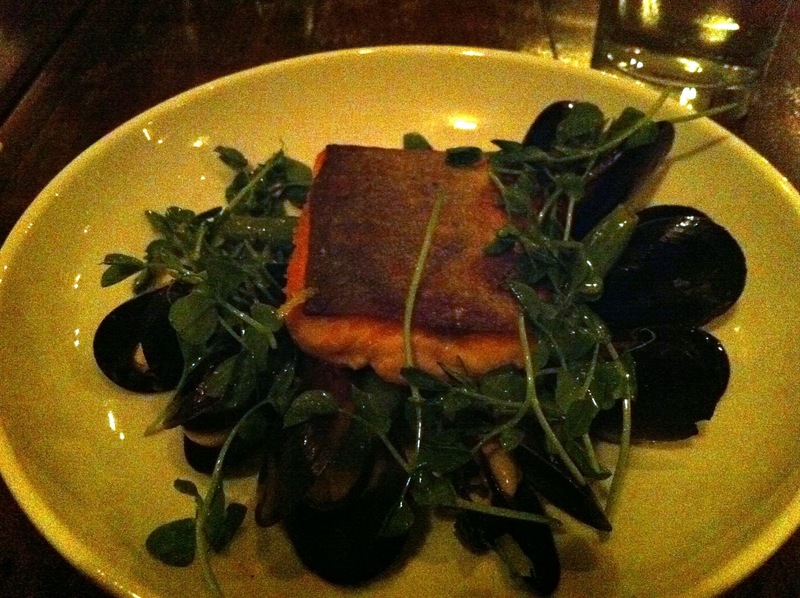 The arctic char was cooked well and the taste was very mild, but also a little boring. The mussels were tasty and were passed around the table quickly. Finally, the dessert menu came around and we couldn't help ourselves to stay disciplined. 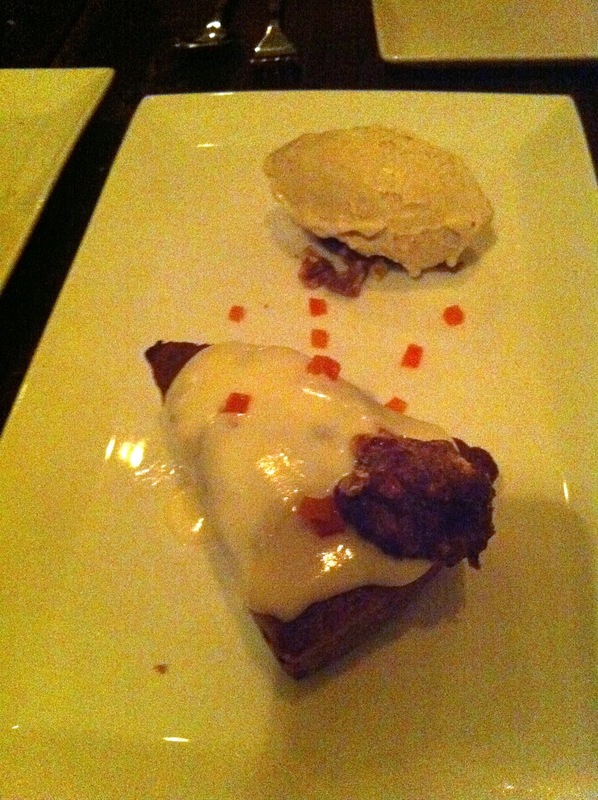 The carrot cake, cookie and belgian waffle were ordered. 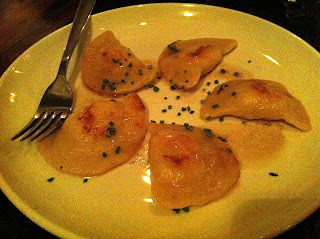 Like the main dishes, it seemed like each dish was missing a kick of flavor. With the desserts it was probably sugar or sweetness. 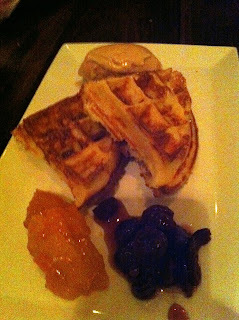 The waffle was our favorite but should have powdered sugar or something more than the fruit and scoop of gelato. We loved the gelato served with the carrot cake and waffle, but that should not surprise since it came from down the street at Black Dog Gelato. I liked Leopold, especially the concept, decor, service and great neighborhood feel. I want to like it more though if it served a tad more flavorful food. It's only been open since New Years and could still be working out some execution kinks in the system since the menu does not need changing. I hope they succeed because now that I live close by, it'd be a great place to add to the roster. Hit Leopold with Elizabites the other week. Liked my cassoulet an awful lot. Even better the next morning!